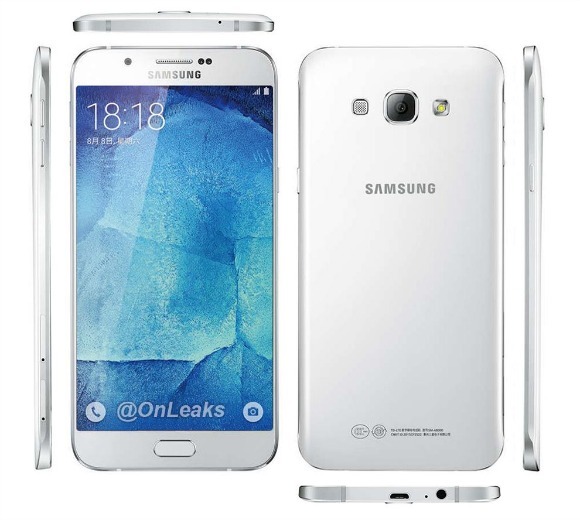 The Samsung Galaxy A8 has been leaking a lot lately. In fact, just a few hours ago we spotted it entering India for testing purposes ahead of its launch. And now we get a new set of renders depicting the next member of the Galaxy A family. They look very much official, so it's possible they've originated at Samsung itself - and someone somehow managed to get them ahead of the unveiling. We've already seen it in live images before (twice, actually), and even in a hands-on video. It's been rumored to launch in China on July 17. If you were wondering how much you'd have to pay for one, you shouldn't anymore. In Vietnam, it's already been listed by one online retailer, while in Malaysia a leaked promotional leaflet has revealed the recommended price. In Vietnam, expect to shell out VND 10,990,000 for the privilege of owning an A8, while in Malaysia it will go for MYR 1,888. Both of those numbers translate into roughly $500 or €450, so this won't be a dirt cheap smartphone. The Galaxy A8 will sport a 5.7-inch 1080p Super AMOLED touchscreen, a 16 MP rear camera with LED flash, a 5 MP front-facing unit, 2GB of RAM, and 32GB of built-in storage. It will run Android 5.1 Lollipop and will be powered by the mid-range Qualcomm Snapdragon 615 chipset, which comes with an octa-core Cortex-A53 CPU. A 3,050 mAh battery is going to keep things running, while a fingerprint scanner will be embedded in the Home button for easy unlocking.